When Chateau Montelena held what they called a “Dream Tasting,” I was happy and privileged to attend., It covered five decades of Chateau Montelena Cabernet Sauvignon. And it was indeed a dream. Bo Barrett, CEO and Master Winemaker, presided over the tasting, adding comments and taking questions. Bo has been present at Chateau Montelena from the very beginning of his family’s ownership. His father Jim bought the Calistoga property in 1972. Bo made many of the wines we tasted. Also present was Matt Crafton, who’s been there since 2008 and has served as head winemaker from 2014. The first Cabernet Sauvignon released by Chateau Montelena, they sourced fruit for it from Napa Valley, Alexander Valley, and Russian River Valley. According to Bo, they picked at around 23 brix, but there was also more acid at that sugar level than there is now. He’s always tried to bring the Cabernet Sauvignon wines in at 14% alcohol or lower. The vintage is 1975, but the wine aged two years in oak, was bottled in 1978, and not released until August, 1979. By then, Bo says they’d won the 1976 Paris Tasting (for Chardonnay), winemaker Mike Grgich had left to start his own winery, and the AVA system was in place, (though the first AVAs wouldn’t be granted until 1981). In the release notes for this wine, Bo suggested people give it at least another two or three years of bottle age before drinking. Apparently, 40 years is okay too. 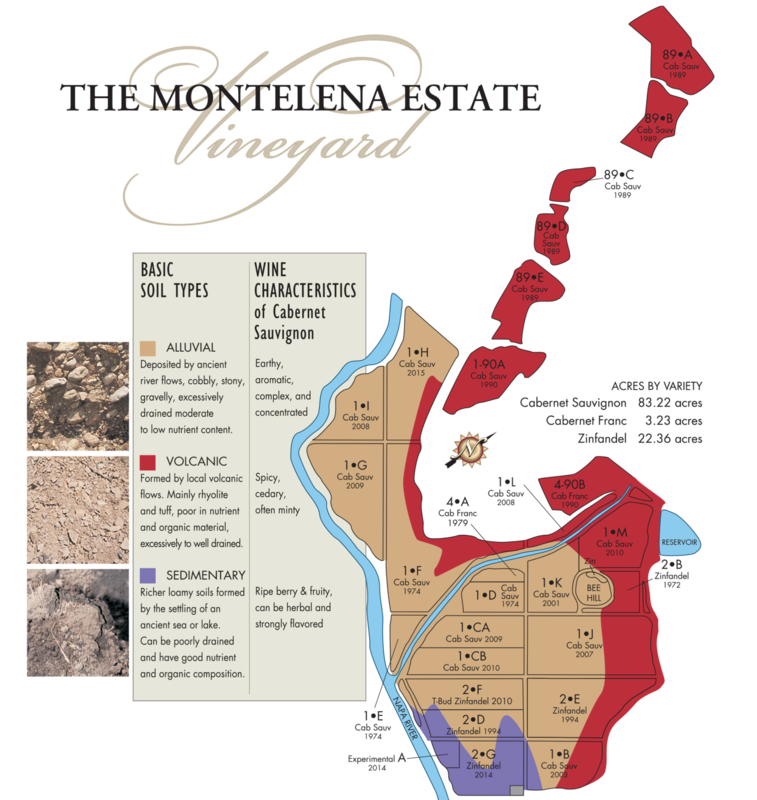 Beginning with 1979, Montelena moved to a program of using the same winemaking and aging regime each year for all lots, in order to better highlight differences between vineyards and vintages. They settled on 20% new oak for the maturation. Inclement weather early in the vintage caused shatter, which reduced Montelena Cabernet yields by 40%. But that allowed for faster ripening, which meant all the Cabernet had been harvested before that year’s late-season, surprise rainstorms. By 1980, the complement of barrels at Montelena included some 12-year old wood. Those neutral barrels allowed the wine’s texture and flavors to soften, but didn’t contribute tannins or flavors of their own. 1988 was the second year of a drought and, according to Bo Barrett, Chateau Montelena had no drip irrigation at the time. Perhaps as a consequence, this Cabernet is intense, concentrated and tannic. Barrett attributes some of the tannins to “stem chips” as, their antiquated de-stemmer didn’t always do a complete job. The drought continued into 1990, except for Memorial Day when a deluge disrupted bloom and flowering. That wiped out about half of Chateau Montelena’s crop. On the bright side, they invested in what Barrett calls a “fancier, state-of-the-art de-stemmer. Considered to be one of the best, perhaps the best, vintage of the ‘90s in Napa Valley, the year offered near-perfect weather. A little shatter at the beginning of the season limited crop load just enough to make thinning unnecessary. 1994 was also the first year Chateau Montelena included a considerable amount (10%) of fruit from the hillside vines they’d added in 1989. 2001 was a good while ago, but with that vintage we see a change in the wines being tasted. It, and the more recent wines, remain quite youthful and their prime drinking periods lie in the future. Yields were down in 2001, due to frost damage and heat-spike-induced shatter. Various vineyard sections ripened at considerably different paces too, making harvest a five-week process. But the result was concentrated fruit with mature tannins. Bud break came early in 2005 for Montelena. But weather varied a lot month-to-month and include cool spells, so harvest came late, culminating at the end of October. I noted a change in the wines’ texture from 2010 on and asked Bo about it. He said his father had challenged them to create the most polished tannins possible, but without resorting to excess ripeness or high alcohol. Achievement unlocked! Alcohols remain moderate and the textures are swoon-worthy. JJ Buckley always has a range of Chateau Montelena wines on offer, including current and back vintages. JJ Buckley guest blogger Fred Swan is a San Francisco-based wine writer, educator, and authority on California wines and wineries. His writing appears in The Tasting Panel, SOMM Journal, GuildSomm.com, Daily.SevenFifty.com, PlanetGrape.com, and his own site, FredSwan.Wine (formerly NorCalWine). He teaches at the San Francisco Wine School. Fred’s certifications include WSET Diploma, Certified Sommelier, California Wine Appellation Specialist, Certified Specialist of Wine, French Wine Scholar, Italian Wine Professional, Napa Valley Wine Educator and Level 3 WSET Educator. He's twice been awarded a fellowship by the Symposium for Professional Wine Writers.